Last weekend, my kindergarten son went on a boat ride with his bus buddy. It was a privately-owned boat, and they went to Mackinac Island for the day. He listened to her direction as well as he always does, and she kept him safe yet again. His bus buddy this year, who is showing him around school, and making sure he gets safely to his classroom each day, and back home again every afternoon, is his older sister. Luckily, they're crazy about each other. This is the only year they'll have at the same school (officially - his preschool was in the same building last year, but that program didn't interact with the rest of the school as much). For years, they'd looked forward to having their classes in the same hallway, or neighborhood, as we called it. But the school district did some restructuring beginning this year, and the neighborhood thing isn't what it was. 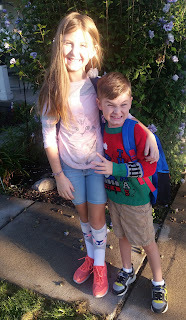 Each morning, they get on the bus together, then when they get to school she makes sure he gets to the kindergarten class line, sometimes picking up a few more kids on her way (our pied-piper of younger children). At the end of each school day, some designated volunteers from her class line up and go to the kindergarten classrooms to get their young charges and take them to the right bus. In our case, they find a seat on the bus together (she says the kindergarteners usually sit up front, but she can keep a better eye on him by having him sit with her). They play rock-paper-scissors, or laugh and play with the friends on the bus, until they get off at the last stop and come home together. He loves his bus buddy. She loves her little bus buddy. It is such a joy to watch them care for each other and look out for their happiness and welfare. I know they get mad at each other too, but I love watching them as a united force against the rest of the world. I hope they'll be bus buddies forever. Wow - they are living their best lives, ha! That sounds awesome. Love this. Hope it continues throughout their lives! !